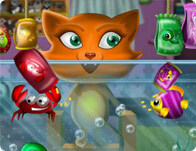 It's time for Sisi to feed her pet fish. Lisa and Mina told her that if she's responsible enough, then she can get some more exotic ones! Each fish requires it's own food, so pay attention to the labels! 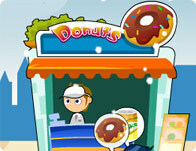 Create a delicious donut empire from the ground up! Run your very own stand, serve customers, prepare order,s buy supplies and advertise as you slowly become the biggest donut store in the world. 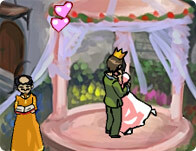 Don't let the princess wedding of your dreams be Ruined by nosy guards and curious wedding goers! 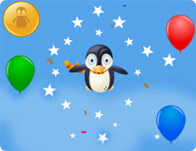 Get down to business and start kissing in this fun and fast paced kissing game! 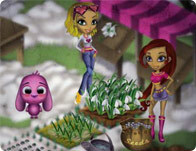 Clear away the snow and plant some cute flowers with your friends from doli doli! You're in charge of your very own small food stand! Serve customers burgers, pizza, hot dogs, fries, soda and more! Be quick and don't hold the quality. Save up enough cash to open your very own restaurant downtown! Wake up, get dressed, have breakfast, feed your dog and go to school! 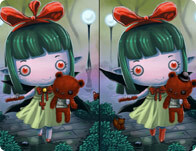 Take on the everyday missions of Carolines everyday life in this cute jr RPG. Love is all around, for a price! Join this savvy Valentines shopper for the shopping trip of her dreams, find everything she's looking for and don't get hung up with buyers remorse! 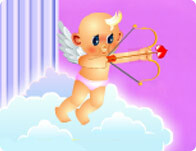 Spread the love with this too cute cupid and his golden bow of love arrows! Toggle velocity and range as you pick off potential suitors and make a love connection happen! Cute, cuddly and adorable! These trusting and smiling bunnies make excellent cannon fodder. Fire them off into the sky and collect cash and carrots for upgrades to build a better cannon and plump up your rabbit buds! Run your very own hair salon and wash, color, cut the locks of friends and customers. Make sure to get everyone's order right and don't leave anyone waiting too long.